Do I Need a Will or a Revocable Living Trust? 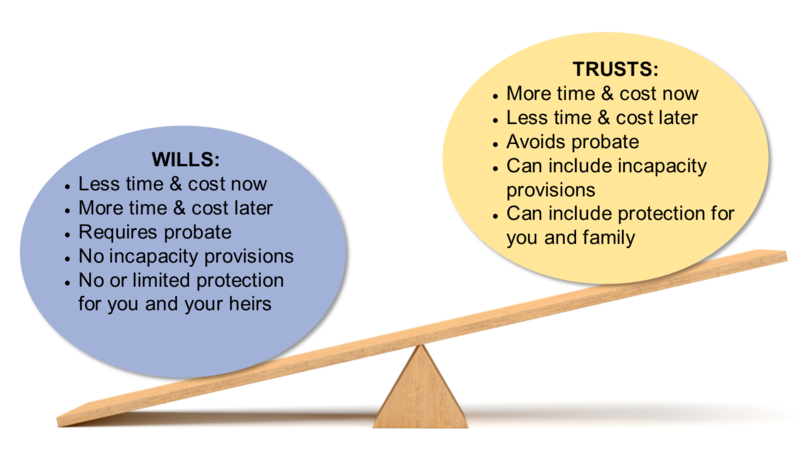 One of the most common questions we receive is the question of wills vs. trusts and which is “better.” Frankly, if time or money were no object, we’d say that a revocable living trust is a better, more flexible, and more robust tool. However, ultimately, the right tool for your estate plan will depend upon your overall planning goals. Many people are led to believe that revocable living trusts are only needed if you’re worried about avoiding probate or if your estate is above a certain size, but revocable living trusts can be used to accomplish many other planning goals. While it’s not a perfect analogy, the wills vs. trusts conversation is similar to a teeter-totter. Generally, Wills tend to be easier to set up and therefore they cost less, but they also usually offer significantly less protection than a trust may. Revocable living trusts may take more time and expense to set up, but they are used to save time, money, and hassle in the future, often while also providing more robust protection for your heirs. That’s why we begin the estate planning process with our uniquely designed Vision Meeting. During this meeting, we’ll guide you through an in-depth discussion of your planning goals—including the use of our unique Vision Explorer tool to help uncover potential planning goals that you weren’t aware were even possible. At the conclusion of the Vision Meeting, we’ll discuss potential planning options to meet your most important planning objectives. Want to Learn More About Wills & Trusts? Feeling overwhelmed trying to sort out your options? Many of our clients have told us that they felt overwhelmed when they first began planning, but with our help, we helped them make sense of the options and design a plan to fit their goals. We've empowered thousands of Wake County-area residents to take control of their future with their estate planning and long-term care planning solutions. To get started, register for one of our upcoming seminars, download our free guide, Estate Planning Pitfalls: The 12 Most Common Threats to Your Estate & Your Family’s Future, or call us at 919-443-3035. What Are Some of the Benefits of a Revocable Living Trust? What's the Difference Between a Testamentary Trust, a Revocable Living Trust, and an Irrevocable Living Trust? Should Your Children Have an Heir Safeguard Trust? Does a Revocable Living Trust Protect My Assets from Lawsuits or Bankruptcy? Will You Accidentally Disinherit Your Children?